Behind every GEF project there are amazing people working hard to rid our planet of the chemicals that threaten human health and the environment. The documentary tries to make you experience firsthand what these projects are all about. With this in mind, a GEF film crew set out around the world to capture the images and voices of the beneficiaries and project teams involved in some of the 300 chemical projects the GEF has funded all over the world. 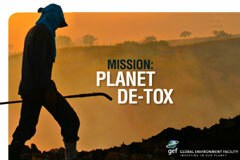 The documentary will premiere at the 2013 Chemicals and Wastes COP in Geneva, Switzerland on 8 May 2013. The full movie, in high-definition, will be released at the same time on YouTube. To complement the documentary a special issue of the GEF’s e-magazine 'The Greenline" - available on the GEF website and as an app in the iTunes store - will share the stories, pictures and video clips of what lies 'behind the scenes' of every project.